Summit Daily/Mark FoxJake Fiala swings his way around the dance floor with professional dance partner Channing Cooke on his way to winning the fourth annual Dancing with the Mountain Stars in 2011. “Dancing with the Mountain Stars,” the annual hospital gala fundraiser styled after the popular television program, ‘Dancing with the Stars,’ returns to the Keystone Conference Center on Saturday. 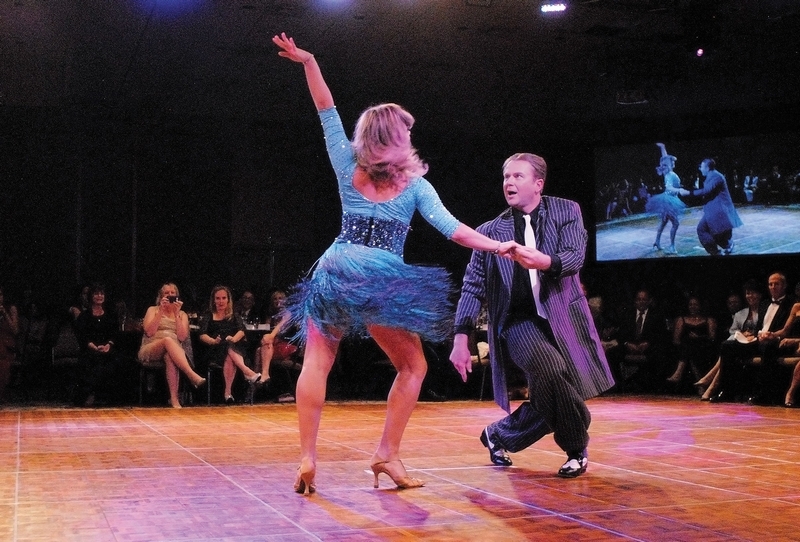 In Summit County’s version of the show, local celebrities practice for two months in advance so they can perform their routines – which range from a slow rumba to a super fast Lindy Hop – with professional dancers at the black tie event, which this year raises funds for a new Flight For Life helicopter. Now in its fifth year, the event is sold out, though fundraising for the helicopter continues. Last year, Olympian Jake Fiala took the Judge’s Choice award and Keystone Science School executive director Ellen Reid won for People’s Choice. Both return to reprise their performances. This year’s “mountain stars” include Keystone vice president and manager John Buhler, community volunteer Cathy Carleton, CMC Summit director of continuing education Rolando Cuadrado, High Country Health Care physician Dr. Erin Hay, Arapahoe Basin vice president and chief executive officer Alan Henceroth, Summit anethesiologist Dr. Kathleen Jenkins, Flight For Life nurse Maureen Maledon, Creative Cabinetry co-owner and Silverthorne councilmember David Preaus and Breckenridge preservationist Patty Theobald. Instrumental to the event’s success is Summit High School graduate Mandy Moore, whose accolades include two Emmy nominations. She is currently on tour as choreographer for “So You Think You Can Dance,” and was recently tapped to choreograph Shania Twain’s upcoming Las Vegas show. As she has for the last five years, Moore did the dances for Saturday’s event, but this year she brought in her former dance teacher, Kim Delgrosso, to finish the project. “I am basically directing the show in Mandy’s absence,” said Delgrosso, who owns a production company that puts on shows throughout the world. Delgrosso founded Summit School of Dance in Frisco, where Moore not only took her first dance lessons as a child but also taught dance as she got older. More than two decades ago, Delgrosso sold the studio to current owner Melanie Frey and moved to Orem, Utah where she is now co-owner of Center Stage Performing Arts Studio. Center Stage is a huge success, having grown to nine studios with a 600-dancer capacity. “We have produced many of today’s best-loved dancers including Julianne Hough, Derek Hough, Chelsie Hightower, Hefa Tuita, Jaymz Tuaileva and many more,” said Delgrosso, whose six daughters also dance professionally. In July, Center Stage bested 170 other entrants to win Studio of the Year and a $25,000 purse at the 2012 Dance Awards in New York City, an event Delgrosso likened to the Academy Awards of dance. She counts working on Dancing with the Mountain Stars among her blessings. “My dearest friends come from here and I find myself humbled by the fact that I am allowed to come back under these circumstances,” Delgrosso said. She will bring six professional dancers to partner with the nine local celebrities for Saturday’s event, including Italo Elgueta, Haylee Roderick, Averie Delgrosso, Abrea’ Delgrosso, Chris Castillo and Ruger Memmott. The dancers will also perform a floorshow demonstration. World-class choreography is part of the equation, but someone has to teach the local stars their routines, and in many cases, how to dance in the first place. Enter the five local dance coaches – all of whom are volunteers – led by Debbie Swartz. The coaches dedicate a great deal of time and effort to rehearse the routines with the local celebrities. “It’s pretty exciting to see the joy of dancing develop among the contestants,” said Swartz, who teaches classes at Summit School of Dance and the Silverthorne Recreation Center. At the rec center, adults interested in ballroom dance can learn the waltz, foxtrot, tango, cha-cha and Lindy Hop – pretty much any of the dances featured in Dancing with the Mountain Stars. Proceeds from this year’s event support the lease of a new Eurocopter AS 350B3E helicopter for the St. Anthony Summit Medical Center, the Summit County base of Flight For Life Colorado, which celebrates its 20th anniversary of service in the High Country this year. The critical care transport service, the first of its kind in the United States, was established 40 years ago in Denver. Delgrosso’s son Forest was a recipient of Flight For Life service when he was flown to St. Anthony Hospital after being hit by a drunk driver when he was 9, Delgrosso said. In the last two decades, Flight For Life’s Life Guard 2 helicopter has transported 5,410 patients and flown more than 750 search and rescue missions in the mountain region. Virtually all of the pilots have military experience and all and have undergone extensive training to be able to fly in the unique environment of the Rocky Mountains. The new helicopter will enhance the speed of Flight For Life Colorado’s rescues by providing more horsepower at high altitudes, the foundation said. To make a donation toward the new helicopter, visit http://www.summitmedicalcenter.org or call Deb Edwards at (970) 668-6906. “It is the greatest time in history to be a dancer,” Delgrosso said, speaking of Moore, her own daughters and her students, so many of whom have realized their dreams on the dance floor. On Saturday, that talent will translate to a revelatory show for a handful of local celebrities too, all of whom dedicate their time to bettering emergency services in Summit County.